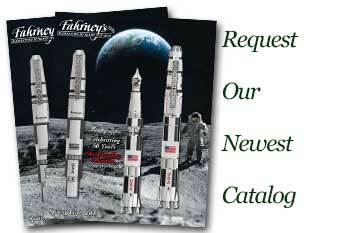 Order your Fahrney's Exclusive Esterbrook Deluxe Limited Edition Fountain Pen today from FahrneysPens.com. Fine Pens, Refills & Luxurious Gifts – great prices & fast shipping. Fahrney’s presents a new exclusive introduction from Esterbrook, ‘America’s Original Pen Company’! Founded by Richard Esterbrook in 1858 and located in Camden, New Jersey, the company became one of the largest pen makers in the world noted for its 100’s of nib styles and classic models like the Radio Pen and the Speedball Lettering Pen. The revival of this iconic brand is launched with the re-introduction of its famous Esterbrook Deluxe model originally released in the 1950’s. The one-of-a-kind limited edition fountain pen is available in three stunning colors: Sapphire Blue, Emerald Green and Burgundy/Black Pearl. Each pen is hand-turned using a special acrylic sourced exclusively for Esterbrook. The luxurious cap and grip section is forged in solid sterling silver, carefully hand-engraved with a classic check pattern and hand-polished to a bright sheen. A sterling silver band and clip and silver-plated German iridium nib complete the pen. Each Deluxe fountain pen is individually numbered on the cap ring with only 150 of each color available worldwide. The Esterbrook Deluxe limited edition fountain pen is sure to be a collector’s item as the first release for the revival of this iconic American brand. Cartridge/converter fill. Converter included. Great in a collection intrinsically and excellent for daily use.